Brandon Russell, a 22-year-old Tampa man, reportedly started the Atomwaffen Division. Two anti-hate organizations are sounding alarms about a tiny, neo-Nazi group tied to five killings around the United States since May, including the murders of two Massachusetts men in their Tampa apartment. The Atomwaffen Division, whose members idolize Adolf Hitler and Charles Manson, is no ordinary hate group, according to the Anti-Defamation League. The group and its violent tactics have gained national attention and are the subject of a Friday investigation by ProPublica, which obtained encrypted chat logs — some 250,000 messages — from members in the group, some of whom cheered at the murder of a gay man at the hands of an avowed Atomwaffen Division member. ProPublica, using interviews and internal records, identified Atomwaffen Division members in at least 23 states, including Massachusetts. The Boston Regional Intelligence Center, a division of the Boston Police Department that tracks such activities, is aware of the group, said Lieutenant Detective Michael McCarthy, a spokesman. In the past two years, the group has plastered recruitment fliers on college campuses in Chicago and Washington, and at Boston University, according to Keegan Hankes, an analyst for the Southern Poverty Law Center’s Intelligence Project, which tracks hate groups. Boston University officials said recently that they had seen no trace of the group in 20 months. The Atomwaffen Division recruits people, sets up training camps in the woods, stockpiles weapons, and plots for a race war, according to the ADL and the Southern Poverty Law Center. Its aim is to use guerrilla warfare to overthrow the US government. Members have been linked to the killings of the Massachusetts roommates in Tampa; a gay, Jewish college student in California; and a couple in Virginia who had warned their daughter of her boyfriend’s neo-Nazi leanings. Atomwaffen, which the ADL said became active in 2016, describes itself online as a “revolutionary national socialist organization centered around political activism and the practice of an autonomous fascist lifestyle,’’ the ADL said. The small paramilitary group promotes the idea that social and governmental systems are collapsing and that democracy and capitalism have “given way to Jewish oligarchies and globalist bankers resulting in the cultural and racial displacement of the white race,’’ the ADL said. Membership has ranged from 24 to 80 people scattered around the country, according to The New York Times and ProPublica. Hankes said the poverty law center has no reason to believe that Atomwaffen is setting up in Massachusetts. The local ADL said last year it became aware that Atomwaffen stickers were spotted on the BU campus. University officials said the fliers appeared in 2016. Campus police circulated a video of someone posting a flier, but there have been no other incidents. Joanna Mendelson, senior investigative researcher and director of special projects at the ADL, said there have been no Atomwaffen-related incidents in Massachusetts since 2016. 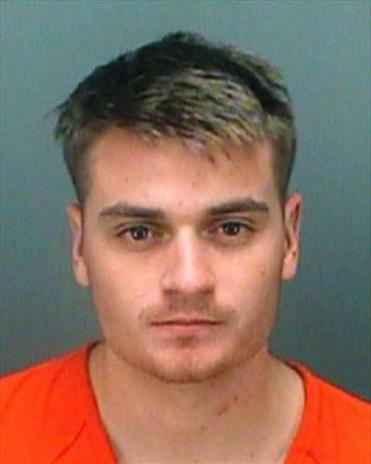 Brandon Russell, a 22-year-old Tampa man, was sentenced Jan. 9 to five years in federal prison after he pleaded guilty last year to stockpiling explosives, according to a statement on the US Department of Justice’s website. He was “an active and founding member of a neo-Nazi group,” the acting assistant attorney general for national security, Dana J. Boente, said in a statement. Russell had been living with Devon Arthurs, who is charged in the murders of two of his other roommates, Andrew Oneschuk, 18, of Wakefield, and his friend Jeremy Himmelman, 22, of Walpole. Arthurs, who pleaded not guilty, allegedly told federal law enforcement officials that the four roommates were active members of Atomwaffen Division, which Arthurs said was started and led by Russell, the Justice Department said. Arthurs also claimed to have seen Russell participating in online neo-Nazi chat rooms, where he threatened to kill people and bomb infrastructure, the Justice Department said. Investigators found explosives in a garage area, including more than a pound of ammonium nitrate addressed to Russell, an FBI affidavit said. They found neo-Nazi and white supremacist propaganda in his bedroom, and camouflage military-type gear containing the name and symbols of “Atomwaffen,’’ the federal officials said. Arthurs is facing two murder counts and other charges in state court, with a bond hearing scheduled for June. Atomwaffen’s alleged involvement also surfaced in the killing last month of Blaze Bernstein, a 19-year-old college student who was found in January in a shallow grave in a park in Orange County, Calif. Bernstein, who was gay and Jewish, had been visiting his parents on winter break. He had been stabbed more than 20 times. Samuel Woodward, a 20-year-old former classmate, was arrested in the murder, which prosecutors say was a hate crime. Three people with detailed knowledge of Woodward’s recent past told ProPublica he was a member of Atomwaffen Division. Virginia authorities have also linked Atomwaffen to the murders of Scott Fricker, 48, and Buckley Kuhn-Fricker, 43, who were killed in Reston, Va., in December. Police have charged a 17-year-old neo-Nazi who had been dating their daughter in their death. The girl had reportedly broken off the relationship in the days before the teenage boy allegedly shot her parents and himself, though he did not die. The ADL said it has seen an increasing number of white supremacist tactics in New England. Since last year, the group has tracked more than a dozen cases involving hateful fliers, protests, or advocacy, though none have been linked to Atomwaffen.